CAGAYAN DE ORO CITY – Stakeholders from Northern Mindanao have issued a strongly worded manifesto asking the Department of Transportation and Communications to defer the planned ‘soft opening’ of the Laguindingan Airport in Misamis Oriental scheduled for April 30, 2013. “We are concerned this will compromise the safety of the airline commuters using this airport and adversely affect the economy of the region due to the cancellation of night flights,” said Arsenio L. Sebastian III, private sector co-chair of the Regional Development Council for Region X (RDC-X). Laguindingan Airport is situated some 46 kilometers southwest of Cagayan de Oro and would serve Northern Mindanao and the Lanao areas. With a total area of 417 hectares, it currently has a 2,100 meter (6,888 ft.) concrete runway capable of accommodating medium wide body aircraft such as the Airbus A320 on a 24/7 basis. The Civil Aviation Authority of the Philippines (CAAP) charged with the operations of the country’s domestic airports said in a letter dated December 12, 2012 Laguindingan airport would be operated using Visual Flight Rules (VFR) pending the commissioning of air navigation equipment scheduled for completion by March 2014. If the April 30, 2013 opening pushes through as scheduled, CAAP Director General William K. Hotchkiss III said domestic airline flights will only be permitted up to 3:00PM which would result in up to 69 percent drops in passenger and cargo volume, said Marlon G. Libot, president of the Communications Link for Emergency Assistance Network, Inc. (CLEAN) said in a Feb. 15, 2013 presentation to the stakeholders. 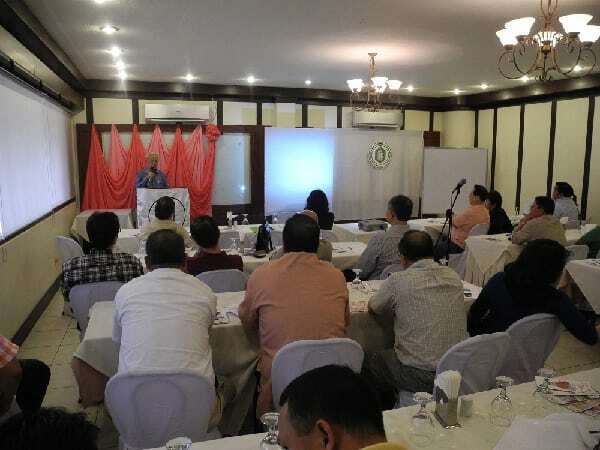 Paras said the coastal highway being built to relieve traffic congestion from the city proper of Cagayan de Oro in the east to the west crossing over the Iponan River and exiting at Opol is not expected to be finished in another year’s time due to budget constraints. Cagayan de Oro’s Lumbia Airport has a total area of 150 hectares and is located 183 meters (601 ft.) above sea level. It is the second busiest airport in Mindanao in terms of air passenger traffic and cargo volume. It is classified as a Class 1 Principal (Major Domestic) airport by the Civil Aviation Authority of the Philippines (CAAP) and has a 2,454 meter (8,050 ft.) asphalt runway. CAAP -10 figures show it accommodated 12,590 flights; 1,301,502 passengers and 22,244,562 kgs. of cargo in 2011. Among the latter were high value agricultural commodities such as poultry products (day-old chicks, hatching eggs); vegetables, herbs and spices; fresh fruits; live crabs, shrimps and prawns, cut flowers and ornamentals, data from the DA RFU-10 AMAD and BFAR-10 show. The DOTC wants to open Laguindingan to free up the Lumbia Airport for the transfer of the Philippine Air Force’s 15th Strike Wing now based in Sangley Point, Cavite. General aviation now based in the Ninoy Aquino International Airport (NAIA) would next be moved to Sangley Point to ease congestion at the country’s premier airport by freeing up 44 hectares of NAIA now occupied by air charter, air cargo, aviation training, aircraft maintenance, and corporate flight operations. The Aquino administration wants to decongest the NAIA which has been experiencing heavy aviation traffic due to the boom in the domestic airline industry brought by the democratization of air travel by budget airlines. Already, fish runs (flights by piston powered aircraft which transport marine products from the provinces to export markets) have been moved to Sangley since May. | Abonitalla” was definitely worth commenting here! Just simply desired to mention you did a great work. 30 opening of Laguindingan Airport – Abonitalla | Abonitalla” was indeed worth commenting on! Basically wanted to point out u did a wonderful job. – Abonitalla | Abonitalla” on my very own web page. Abonitalla | Abonitalla” was in fact a superb blog post. If solely there was far more websites just like this specific one on the actual word wide web. 30 opening of Laguindingan Airport – Abonitalla | Abonitalla”? the play, pause, fast forward and rewind controls. The leawt you can do is set up a website about the blog.